On 1 December a packed attendance at St Martin’s Church, Dorking heard – for many of them possibly for the first time – a performance of Britten’s early cantata, St Nicolas. Appropriately, since Britten had composed it in 1948 for amateur musicians, except for the tenor solo and a small string ensemble, it was performed by members of the Brockham Choral Society and the Junior section of Farnham Youth Choir (FYC), both under the direction of Patrick Barrett, with the support of the British Sinfonietta String Ensemble. The cantata tells the legendary story of the life and travels of St Nicolas, who became Bishop of Myra in Palestine and performed many “marvellous works”, including the miraculous restoration to life of three boys who had been killed, “pickled” and served up on an inn menu. To guide us through this saintly life’s journey Britten’s music progresses through a striking variety of instrumentation, vocal style and musical feature, with the personal narrative of the Saint himself interspersed with contrasting choruses, of differing balance, sonority and texture, by the two choirs. The weight and gravity of the experienced Brockham adult choir contrasted with the vibrantly fresh response of the eager young voices of the FYC sopranos and altos. The substantial role of Nicolas as an adult was sung from the pulpit movingly and magisterially by the Welsh tenor, Rhys Batt, in an outstanding performance of which Peter Pears himself would have been proud. To complement this we were treated to the piercing vocal purity of a solo performance by Oliver Brelsford as the young Nicolas, and by Jaya Passington, Evelyn Keys and Molly Hunter as the three resurrected “boys”. Accompanying the choirs, soloists and accomplished string ensemble throughout on a single piano Brockham’s Marion Lea and FYC’s Susan Holmes brilliantly maintained the rhythm, atmosphere and pace of the narrative, not least in the storm scene which almost brought the wind and rain of the cold December evening right into the church itself. As a fitting and more familiar finale, and in no sense an anti-climax, the cantata finished with a combined choir-audience rendering of that old-favourite hymn, “God moves in a mysterious way”, accompanied resoundingly by Ben Giddens on the organ. After the interval both choirs combined in a welcome Christmas programme of well- known carols, in which the audience were allowed to participate and try to maintain the basic tune as the choirs soared into their respective descants. 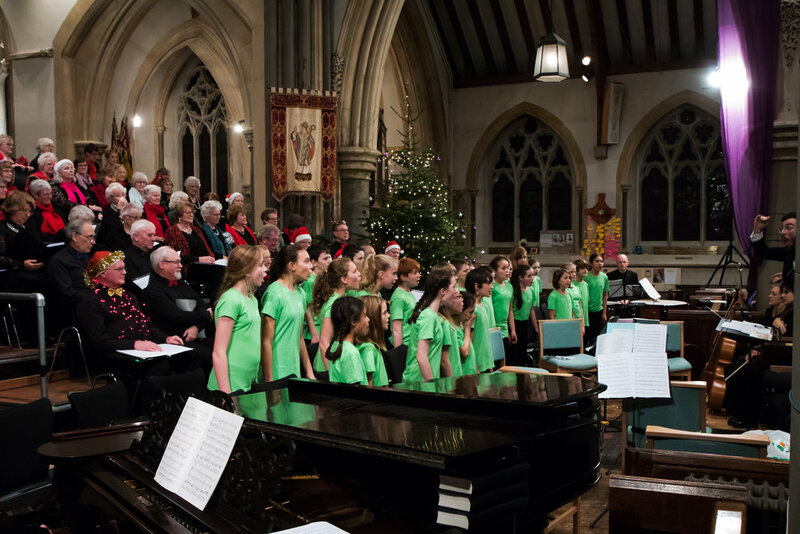 To allow the audience to draw breath Brockham choir also entertained with less familiar renderings of Away in a Manger, the Candlelight Carol and The Holly and The Ivy, while the FYC Juniors displayed their vocal and physical agility in three two-part songs by Benjamin Britten. It was a very successful evening, displaying the virtuosity of two well - rehearsed and contrasting choirs in an important but less familiar work, and with due respect to the first class professional performers, showing why Britten’s confidence in writing for amateur musicians was fully justified.